What would happen if you pieced a story together from 12 different points of view, using each of the Zodiac signs? For a start you’d end up with a great big doorstop of a book even if half of it was simply a dissection of one day. And you’d also end up with more in-depth characterisation — both physical and emotional — than might seem possible to a lay reader. Then what would happen if picked a time and a place to set your story, say the goldfields of Western New Zealand in 1866 — and drew up an astrological chart for that time? You might just be able to imagine a plot that would encompass the actions of all seven visible planets, including the waxing and waning of the Moon. 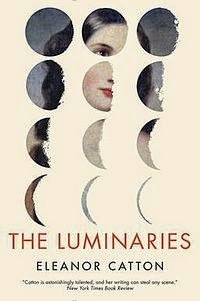 If you have even the slightest interest in astrology, you must read The Luminaries by Eleanor Catton. It deservedly won the Man Booker Prize this year: it’s a great read — gripping, lucid and funny. It’s an adventure mystery set during the New Zealand gold rush of the 1860s which will keep you puzzling and guessing right up to the last page. At the heart of the story are a death, a disappearance, a lost treasure or “bonanza” in the slang of the time and a couple of love stories, one of them “star-crossed”. But the real bonanza for astrologers is Catton’s love of astrology, its language, its archetypes, its patterns. She has used the charts of 1866 over the Hokitika gold fields to structure her story, titling each chapter according to the planet e.g. “Mercury in Sagittarius”, “The Greater Malefic” and so on. The storytellers are clearly shown in the astrological charts* that open each of the 12 (decreasing) sections of the book, and on a page at the start labelled Character Chart, so you are in no doubt as to who represents which sign. conjunction of Venus & Mars — which is pivotal to the plot — in Virgo, the novelist’s sign. 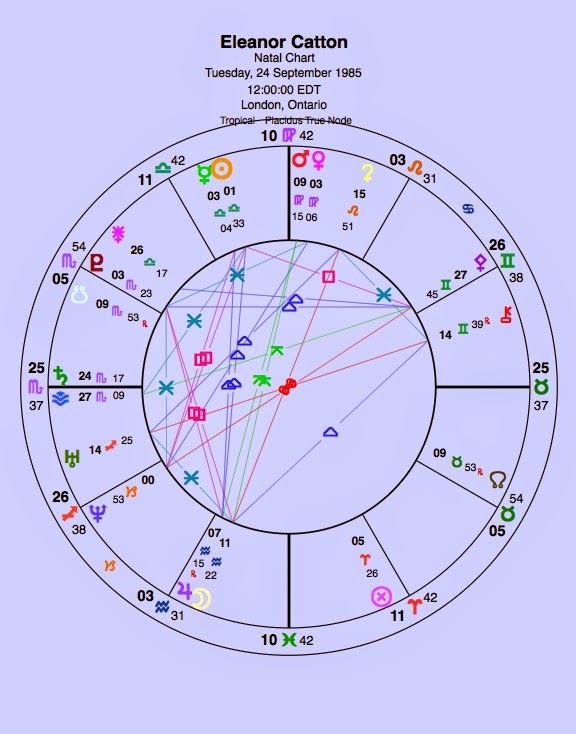 Also Jupiter and Moon in Aquarius: Catton is brilliant at people’s stories, but short on emotional depth. No birth time is available. This chart is set for noon. Each of these men – they are all men – is carefully delineated using basic astrological characterisation. It’s a delight to have these archetypes in the hands of a brilliant storyteller like Ms Catton. So for example, Sagittarius is a shipping agent, of course; Cancer a hotel-keeper; Scorpio a chemist; and Gemini a journalist. Catton really goes to town on the detailed descriptions and uses astrological archetypes in unexpected and creative ways. For example, Thomas Balfour, the Sagittarian shipping agent, started life in a saddlery and was orphaned as he entered his 12th year. Another small example, Clinch (!) the Cancerian hotelkeeper expresses his love by running someone a bath. You will find yourself agreeing and disagreeing with how Catton has represented the signs. She seems to have much more sympathy with some. Poor Leo gets a really bum character reference and Capricorn seems a little unlikely, but Pisces as a preacher is perfection and the young Taurean banker (naturlich) rings true. These are not complete expressions of each sign, that would be beyond the scope of any book, but these are far deeper explorations of what each sign means in terms of psychology than you would get from a textbook. I couldn’t help thinking of Linda Goodman’s Sun Signs — I bet that would make the Man Booker judges gag. There is more to The Luminaries than the signs of the Zodiac though. The real actors in the tale are the planets. Venus and Mars are the baddies, with Venus emerging as one of the most thrilling wicked women in fiction in a long time. There must be fist fights in Hollywood over who gets to play Lydia Wells, madam, owner of a gambling den and manipulator of men, in short the dark side of Venus. The book will surely be made into a brilliant miniseries. The two kings, Jupiter, a politician, and Saturn, a jailer, vie for power. But the action, it transpires, is around the luminaries — the Sun and the Moon. I don’t want to give away any of the plot because it’s too good to spoil, but there’s no doubt that understanding the astrology makes it much easier to keep all 19 characters plus one Crosbie Wells (aka Terra Firma) in your head. How does the story begin? With the arrival of Mercury after a long journey, of course, and the telling of tales around a hearth. *A note on these charts. They are backwards, which is not especially helpful. There are reasons for this choice, I’m sure, but it does seem a bit perverse. Use this link to buy the book and help fund The Oxford Astrologer. Hi Christina … welcome back! Maybe I’ll have another go, but I’m wondering if it’s simply above my ability to ken (astrologywise). No it is definitely not above your ability astrology-wise. Think Linda Goodman next time you get it out and you’ll find it’s a cinch. I read this book last year and I did finish it. I found the astrology she used correct, but was not very impressed by the story. Maybe that is a matter of taste. However, I found it brave she used astrology in a book, as she could have been attacked by all sorts of critics who do ” believe ” astrology is superstition !! It seems like most reviewers in this country just could not bring themselves to believe that she believes in astrology. I read several who declared they loved the book except they couldn’t see what the point of the astrology was, which is kind of funny because the whole book is entirely based on astrology. I am very pleased that she came out about the astrology, she could have simply excised it. I found it overly long but I enjoyed the chinese puzzle aspect entertaining. These reviewers surely missed something – I guess you have to be an astrologer to see the meaning of astrology in this story.. The link to buy the book doesn’t work. Thanks for telling me. I’ve tried to fix it once already!